In 1984 he was given state award. In U.S.S.R. festival held in year- 1987 he was required to prepared and present a film displaying his artistic creations. He had the great privilege of making his substantial contraposition in the production of film on folk painting ( phad painting) through film division for U.S.S.R. festival. The same was much appreciated by many foreign art to many trainees. In 1991 he had the honour to get KalaShree in Suragkund in the same year. He was required to demonstrate the process of his artistic creation and display the same in Barcelona in Spain. 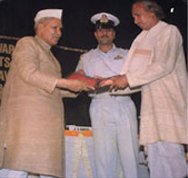 In the year 1991 He was honoured with the presidential awarded in New Delhi. In the 1995 he had the great privilege of making film on the traditional phad painting for the department of Culture ministry of Human Resource Development New Delhi and in this connection he was given a glowing tribute by way of a certificate and the copy of the same attached. Again in 1997 his services were availed of by requiring him to Impart training to would be Artists at Bal Bhawan goa and National Bal Bhawan New Delhi. His artistic creations art presented not only in the form of the separate identity and unit but also presented in the form the panoramic display in along continuous series. The subjects of such presentation include mythological gods and goddess, Folk Tales and historical events. For example he has successfully used only stone colour and traditional materials. There are several schools of painting such as Kangra, Mughal Bundi, Kishangarh, Jaipur, Kota, Nathdwara etc. But the subject of all the schools of art mostly common. However, the art of his phad painting is quite different from the above mentioned schools of art. His phad painting depicts the advanced stage of Rajpur school of art. The Uniqueness, and novelty of his phad painting is primarily based on the mythological stories related of be lives and achievements of various Hindu gods such as Pabuji, Devnarayan, Ramdala (Related of the Ramayan) Krishnadala related to the Krishna, Mataji ka chandwa and Baba ramdeo. Above all he has also very successfully attemped the Historical facts in his phad painting such as the invasion of Mahamud Gajnavi on Somnath Temple, the battle of Haldighati between Rana Pratap of Mewar and Raja Man Singh of Jaipur who was emperor Akbars general, Johar of Rani Padmini, Elopement of Sanyogita by Prithviraj. As yet no other artist other than that of shahpura has been given the honour of winning National Award in phad painting. In 1998 exhibited his phad painting in CALCUTTA and also give training to lady trainess he was also honoured M.P. Birla Foundation for introducing new dimensions and keeping the art alive. By the way you would be pleased to learn that luckily a display of his art was made at the time of visit of H.E. the President of America on March 23 at the Amer Fort (Jaipur) this year and the same was highly appreciated by the honourable guest.